Most personal finance tools seem aimed at the high-net-worth individual, or at least the financially sophisticated one. At first glance iFinance is no different, with its support for multiple currencies, share price tracking, and so on. But amid these features is a straightforward tool for recording your financial affairs and forecasting them across several bank or credit card accounts. It's easy to set up regular recurring transactions like mortgage payments out and salaries in to get an estimate of how flush you won't be in a month or a year. A helpful Budget feature lets you see how much of an allocated sum you've spent and how much remains. You can use it to track your monthly grocery bills or for longer term spending like work on your home, and you can be warned when you're running out of budget. Dutiful record-keepers will appreciate CSV import and export to keep iFinance in sync with spreadsheets and online bank accounts. 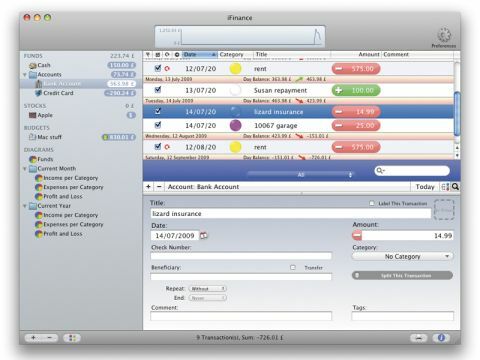 iFinance's interface is not always instantly intuitive. For example, it can be a little awkward to ensure all expenditure is properly allocated to a budget, and typically of such apps, it suffers from a mild case of feature bloat; few users will require monthly profit and loss figures. But whether you need a way to manage your fortune or just reassurance that your iTunes habit isn't getting out of hand, iFinance does an efficient job. Users of versions 1 and 2 should note that upgrades are free.